Digiperform > Blog > Digiperform in Media > Digiperform launches its 38th center in Basavanagudi, Bengaluru. 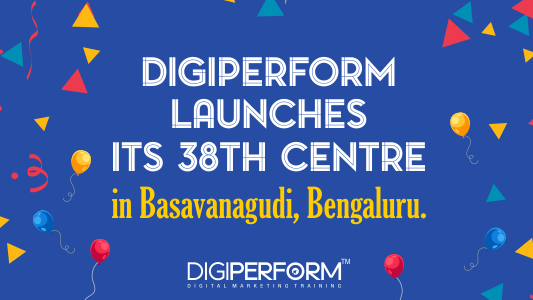 Digiperform launches its 38th center in Basavanagudi, Bengaluru. Get Ready Bengalureans! We Are Now Live In Basavanagudi! Digiperform is spreading its wings all over Bengaluru by launching its 4th center in a row; in Basavanagudi. Basavanagudi is a well-known place located in South Bangalore, along with the borders of Jayanagar. Our other 3 Bengaluru centers – BTM, Indiranagar, and Malleshwaram are already running and winning the hearts of Bengalureans; and have empowered 350+ students with digital marketing training in a span of 6-7 months with 15+ batches still going on. The launch was followed by a great ceremony under the presence of Chief Guest Shri. P.B. Kotur (Global Goodwill Ambassador, Author, Educationist, Global Talent Transformer, Motivational Speaker, Corporate Leader), accompanied with Digiperform Basavanagudi Partner – Mrs. Kasturi Kolhar and Chief Operating Officer, Mr. Kunal Virmani. Digiperform India’s Most Trusted Brand in Digital Education who believes to provide digital marketing skills and empower the millions to be the part of the most demanding industries of this century, to all everyone irrespective of their degrees, classes, organization levels, and gender. Digiperform provides two major certification training in online marketing i.e. Digiperform provides these courses to fresh graduates, working professionals, and wannabe entrepreneurs, with a motto to enable them to be self-employed get placed in top organizations & understand the operation of Digital Marketing to run their own empires.